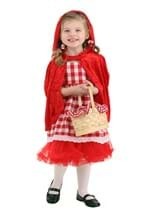 When she wears this Traditional Girls Red Riding Hood Costume, warn her to watch out for the wolf! 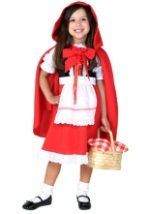 It includes a cape along with the dress. The dress bodice is styled to look like a laced vest over a blouse. The long-sleeved blouse portion is white poly-cotton broadcloth; the sleeves have elastic at the wrists and the neck is edged with eyelet trim. 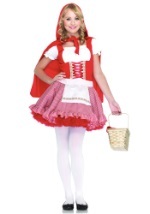 The vest portion is black stretch velour, with red satin ribbon lacing in the front and a zipper at center back. 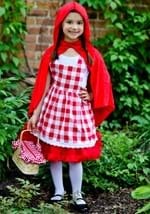 The full skirt is red poly poplin edged with eyelet at the hem. 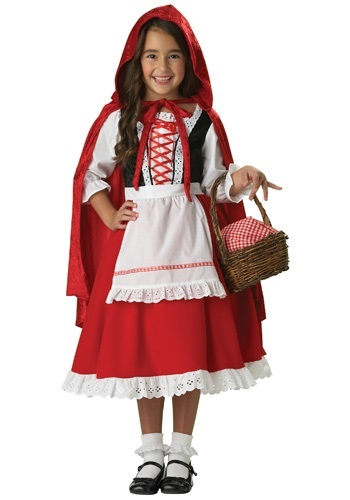 It has a white broadcloth apron sewn to the front with a sash that ties at the waist. 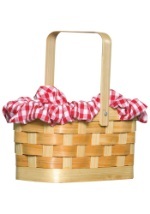 The apron is also edged with eyelet, and has a strip of red gingham ribbon just above its hem. The petticoat has an elastic waist and is made of white tulle over satin. 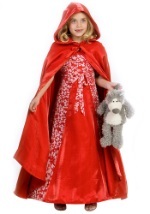 The hooded cape, of red cotton knit velour, fastens at the neck with self-fabric ties. 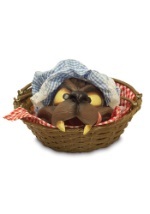 Fill her basket with lots of goodies!